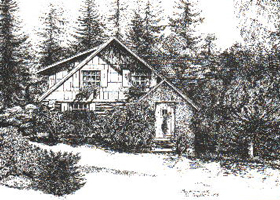 New Sweden Cultural Heritage Society was chartered in 1989 for the purpose of sharing, promoting, strengthening and maintaining our Swedish culture and heritage. We accomplish this through a variety of events and activities. 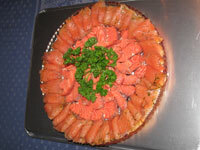 New Sweden produces two traditional events- the August crayfish party- Kraftskiva, and the Lucia Fest in December. As a member of the League of Swedish Societies, we partner with Nordic Northwest to create a Swedish Midsummer highlighted by dancing around the midsummer pole. 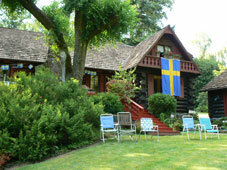 Additionally, we offer cooking classes, share traditional Swedish recipes, enjoy potluck picnics, crafts, lectures and exhibits. Our organization is inclusive and its' members come from a variety of backgrounds-some were born and raised in Sweden, some have Swedish heritage, and some have no direct connection to Sweden besides an appreciation of the culture. 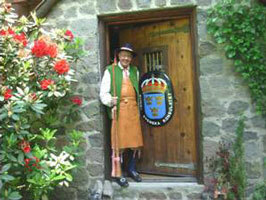 We welcome your interest in the New Sweden Cultural Heritage Society and invite you to join our active organization. Please review our past newsletters to learn more about us and check out the events we have scheduled for this year. With your membership, you will receive our quarterly newsletter. The newsletter and website will keep you informed about upcoming meetings and events. Be prepared to enjoy the many benefits of membership in New Sweden, most especially the opportunity to share with others your interest in preserving the traditions of Sweden in America! 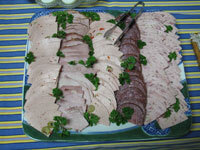 Herring Salad is a must on the Christmas Smörgåsbord. 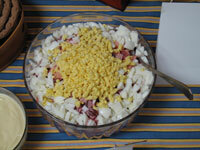 It includes pickled beets and cold boiled potatoes among other things. 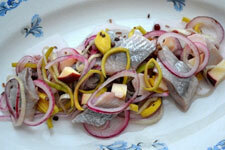 There are many variations of Pickled Herring. 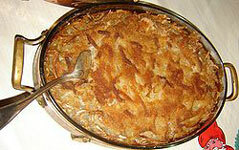 The recipe presented here represents the classic traditional version. 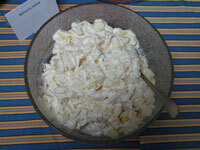 Mimosa Salad is a salad that also comes with some variations. To this recipe you could add chopped up orange sections, grapes, and some peas. 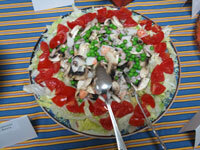 West Coast Salad is a refreshing salad among many "heavier" dishes on the Smörgåsbord. 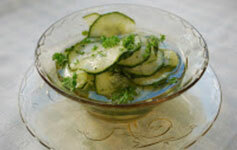 These freshly Pickled Cucumbers are easy to make, and a good side-dish to many meat-based dishes. The plate is a "no-brainer", where you put together a variety of deli-items which hae been "cooked" by somebody else. Before preparing this dish, the salmon should be stored in the freezer for a few days to kill any bacteria, and then thawed in the fridge. The anchovies used will melt into the dish and flavor it wonderfully. A must-have dish in on the Smörgåsbord. Everyone loves this recipe. 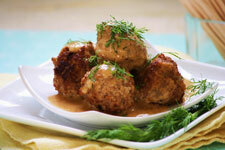 It comes from a Swedish Food Magazine (Allt om Mat) from 1979, and has been my only meatball recipe since then.